On Tuesday, March 20th, Linden Lab deployed the mid-March Sansar update. This release builds on some capabilities added in recent Sansar updates, but also sees the removal of some functionality. The release notes provide full information on the new features, updates, documentation changes and resolved / known issues within the release. The following is a general overview of the update’s key changes. As with Sansar deployments, this update requires the automatic download and installation of a client update. One launching the client the first time, following update, the log-in splash screen’s Remember Me option will be unchecked, and needed to be re-checked for log-in information to be correctly retained by the client. Changes to the avatar inventory support means that on logging-in for the first time following the update, users will be placed in the LookBook (Avatar App). Recently, the Lab added a new Events page to the Web version of the Sansar Atlas. With the mid-March release, a similar option has been added to the Sansar client, as well as the ability for Sansar experience owners to create and list their own experiences. Displaying and creating events are both accessed through a new Client UI icon – the Calendar icon. On the Atlas display, this appears directly under the LookBook icon (see right), while within an experience it is located below the Atlas icon. Featured events: the default view – as curated by the Sansar team. All events – all upcoming events. My events – the events you have created. Both Featured and All events are listed in date / time order. Currently, you can only create events that you are hosting within your own experiences. 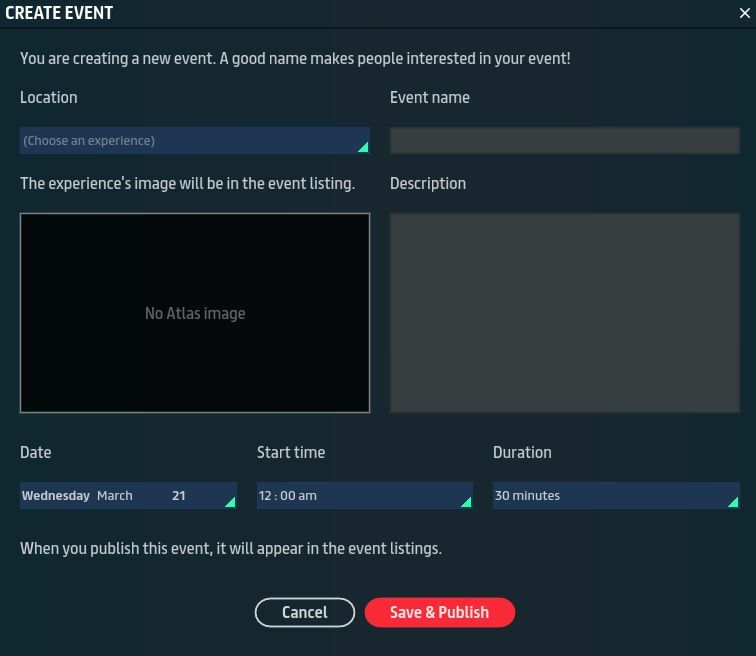 There is a known issue: if you delete the experience associated with one of your upcoming events, the event listing disappears but the time slot remains in use, preventing you from creating another event at that time. Those encountering this problem should submit a request to Sansar customer support, making sure to include a new URL for a valid Sansar experience. See also: Sansar Event Guidelines. It will no longer be possible to upload new height maps. It will no longer be possible to list new height maps on the Store, either uploaded or those already in inventory. It will no longer be possible to pull terrain sculpts from inventory for use in a scene. It will no longer be possible to paint, sculpt, reposition, rotate, etc., terrain in scene. Terrain elements will still work as expected in published experiences, but again, they will not be editable within the experience’s scene. Creators who have used the terrain editor / height maps in their experiences are encouraged to remove / replace them between now and the end of April. From the end of April all such items will be replaced with a place-holder asset. The Lab is offering to work with creators to ease the transition, and offer notes on working with terrain using alternatives through third-party tools – Maya, World Machine, Terragen 4 and ZBrush 4R8. The mid-March release adds the ability for scripters to offer script updates through the Sansar Store. Full instructions are provided in the Selling Items in the Sansar Store knowledge base article – but again, take note that at this point in time, updating items only applies to scripts (the article implies any item can be updated). The mid-March updates bring a number of avatar related updates. Both are fairly self-explanatory. In addition. upper / lower body gestures can now be combined, so avatar can now dance and clap (enter /dance in local chat and then enter /clap). Such combinations can be done when running or walking as well. Visible item names: clothing and accessory names are now being surfaced in the avatar customisation inventory. Right-click menu: the small green triangle at the corner of clothing and accessories item has been removed. Right-click on accessories and clothing items to discover action items that apply to that item. Triangle Density mode – Screen space – This Triangle density mode calculates triangle density per pixel. Triangle Density mode – World space – This Triangle density mode calculates triangle density relative to the size of the world. Wireframe – Outlines all visible triangles in a scene to help you identify geometry that can be simplified in order to reduce primitive count and triangle density. Lighting Complexity – Provides information regarding the number of lights illuminating the same area in the scene. C# script files can now be up to 1MB. Voices will travel much further from the avatar in the direction the avatar faces. On the flip side, voice will travel less from behind an avatar. Performance optimisation, including texture compression upon scene loading. Again for full details of the release, please refer to the release notes.